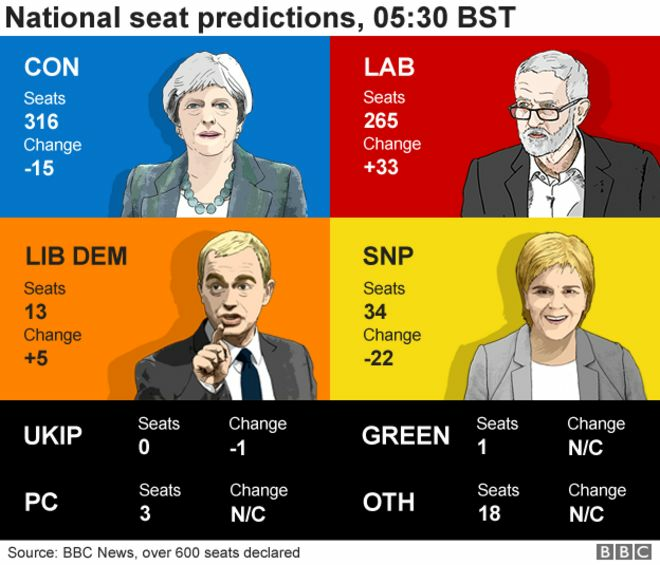 Our team has been on the prowl assessing the UK Elections and we have been blown away by the results: The United Kingdom has a hung parliament. This is the third hung parliament as the post-elections analysis is in full force. As the conservatives have grown to be the second largest parliament in Scotland as it clearly appears that the independence movement in Scotland has lost steam. There is one very interesting development: The UK Independence Party is a spent political force. Our team found it quite startling as the Exit polls have been almost spot on in the UK--which our team found absolutely amazing. If the Queen's Speech is voted down (which is the Government manifesto), The Labor Leader Jeremy Corbyn may be invited by the Queen to form the Government. If he fails, there will another general election. This is as the Brexit Negotiations loom.. It will be fascinating to be witness to it all as the World awaits an impending statement from the British Prime Minister assessing how best to put together a workable government as there are rumours of leadership challenges including the outgoing Foregin Secretary, Boris Johnson--who was one of the leading Brexit campaigners.